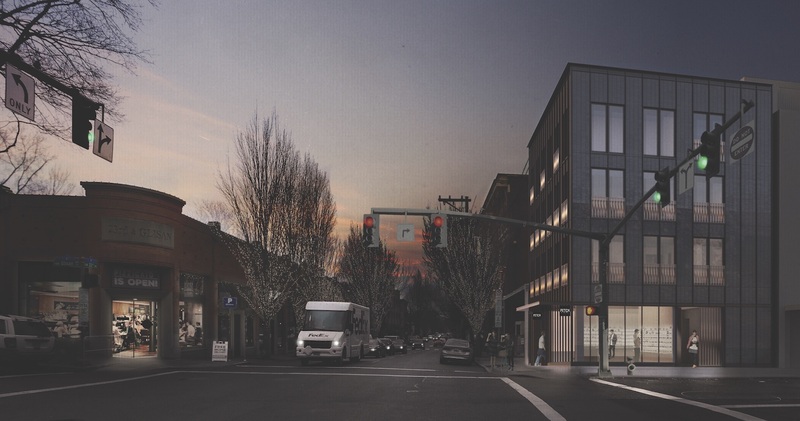 2275 NW Glisan St, as presented to the Historic Landmarks Commission in March. The new building is proposed on the site of the 2016 gas explosion. Every week, the Bureau of Development Services publishes lists of Early Assistance applications, Land Use Reviews and Building Permits processed in the previous week. We publish the highlights. This post covers April 23rd to April 29th, 2018. DESIGN HEARING – Future code:project is a full block of mixed use; office, hotel and residential in a 33 story tower and podium configuration. Parking will be configured below grade in 4 1/2 levels. Gross floor area is approx. 750,000 SF above grade and 160,000 SF below grade. The project will be entitled in accordance with CC 2035 amendments. 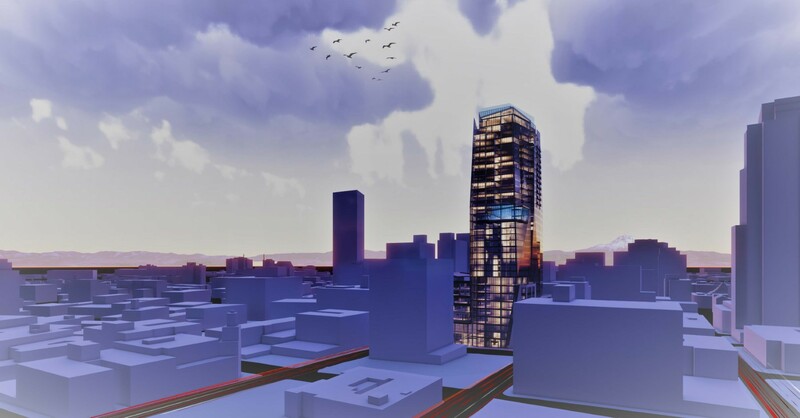 Future code: Proposal includes partial demolition of existing structure, reducing the existing theatre to the south half block and creating a mixed-use apartment tower to the north half. Retail lobby, and amenity area are proposed on the ground floor. Parking will be below grade. Alterations and improvements to the existing Artist Repertory Theatre within the south half of the block will be under a separate design review and permit. Approval by others. Future code: remove single family house to build 3-story mixed-use apartment building. Building will have commercial space, one (1) residential unit on the first floor & three (3) residential units on the second floor, and three (3) residential units on the 3rd floor (7 units total). Flat roof will have AC units. Front elevation will have brick facade with balconies, store front at ground floor. Cement siding will also be used. Future code: 60 new affordable rental living units and new chapel on CG zoned portion of property (changing to CM2). Four story mixed use residential building. Site is location of 2016 gas explosion. 2 level, 800 lineal ft addition to existing concourse E, to include new hold rooms and concession areas. New construction of 3 story 4-plex and site improvements. New 4-story, 64-unit building septic decommissioning required. Call for inspection 842.